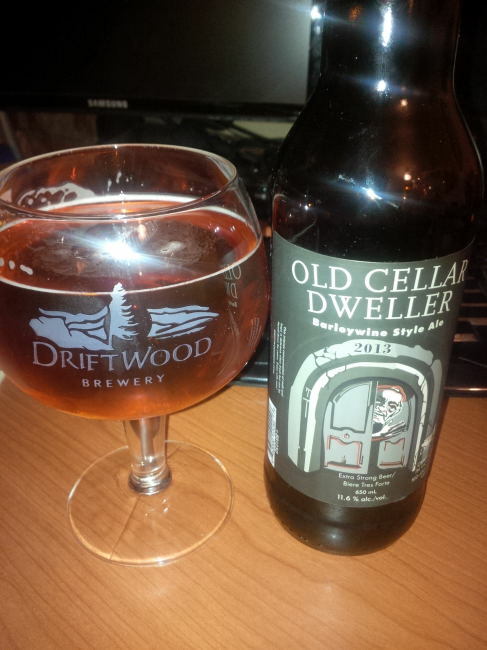 From Victoria BC’s Driftwood Brewing comes the “Old Cellar Dweller Barleywine Style Ale 2013″. This is a Winter 2013 Vintage opened up soon after release. This barleywine is a very different animal than any other vintage that I have tried to date. The beer pours a medium copper colour with a white head. The aroma consists of malts, caramel, citrus fruits and floral hops. The flavour is of big hops bitterness and pine with caramel, citrus, malts and big alcohol warmth. The alcohol content comes in at 11.6% with a high IBU probably in the neighborhood of last years 75 IBU. Something happened this year with the barleywine it seems. This seems more like a triple IPA than a Barleywine. Don’t get me wrong this is a great beer but it does not really fit into its category. Age this beer for a few months minimum to bring down the alcohol warmth present. Commercial Description: This intense concentration of malt and hops is delicious when fresh but can be layed-down for years. Enjoy with care! This entry was posted in Barleywine Ale, Imperial and tagged 2013, 2013 vintage, alcohol, alcohol burn, alcohol warming, alcohol warmth, barley wine, barleywine, barleywine style ale, bc, beer, big alcohol, big hops, bitter, bitterness, canada, caramel, citrus, driftwood brewery, driftwood brewing, fruit, fruits, fruity, hopped, hops, hopy, imperial, malt, malts, malty, old cellar dweller, pine, piney, seasonal, victoria, vintage, warmth. ← Belgian Dubbel – Lake of the Woods Brewing Co. I have heard mixed reviews on this. I have one in the cellar but I may have to grab another to drink it now! You should always try one fresh if you cellar beer. You have to know how it started to appreciate how it ends up.